Take a break from the usual tomato-based lasagna with this creamy casserole featuring a favorite Italian vegetable: artichokes. Made with no-boil lasagna noodles, this dish comes together quickly and results in fewer dirty dishes to clean up afterward. It’s so creamy, cheesy, hearty, and delicious that you and your guests won’t even notice the lack of meat. 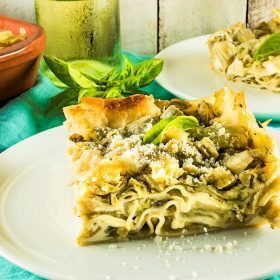 Italians love artichokes, so I made a light and easy summer artichoke lasagna recipe as the star of the dish. I wanted to make a vegetarian dish that is so creamy and tasty that I wouldn’t miss the meat, so I came up with this recipe. I cooked the artichoke hearts in a white wine sauce and then just layered it with no-boil pasta sheets, mozzarella, and Parmigiano-Reggiano. So simple! It only takes minutes to make, and it’s prefect for a light lunch or dinner party, because, like with traditional lasagna, you just put it in the oven when your guests arrive, and it bakes while you are hosting your party. All of your meat eating and vegetarian friends will love this equally. Looking for the traditional way to prepare lasagna? Check out our lasagna recipe which includes also history and variations of the main dish. Prepare lasagna like you never tried it before. 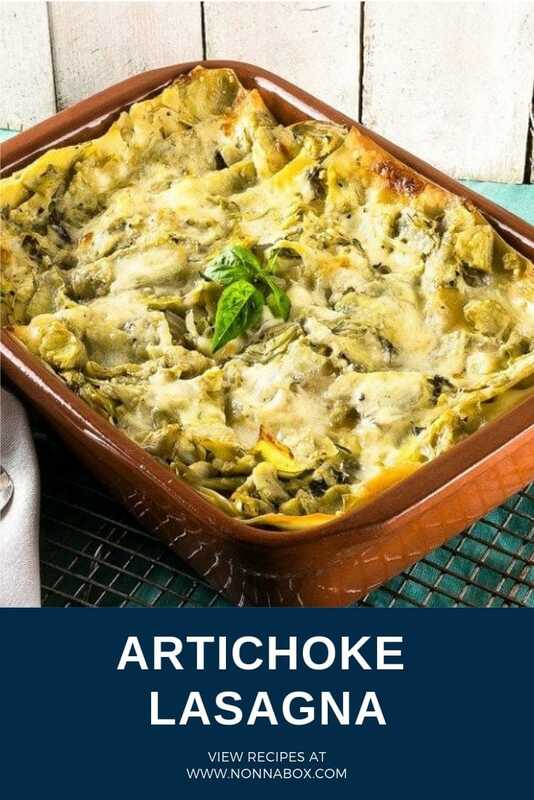 This vegetarian version of the recipe uses artichokes instead of meat filling. In a large sauté pan, add the olive oil and shallot and sauté on medium high until translucent. Add the garlic and sauté for 2 minutes or until fragrant stirring continuously. Add the artichoke hearts, salt, pepper, and chili flakes, stir, and cook for 3 more minutes. Add the parsley and white wine and cook until the wine evaporates, about 3 minutes. Add the water and taste, adjusting the salt if necessary. Put the lid on and turn the heat to low. Cook for 30 minutes or until the artichokes are soft and you still have enough broth to cook your lasagna. 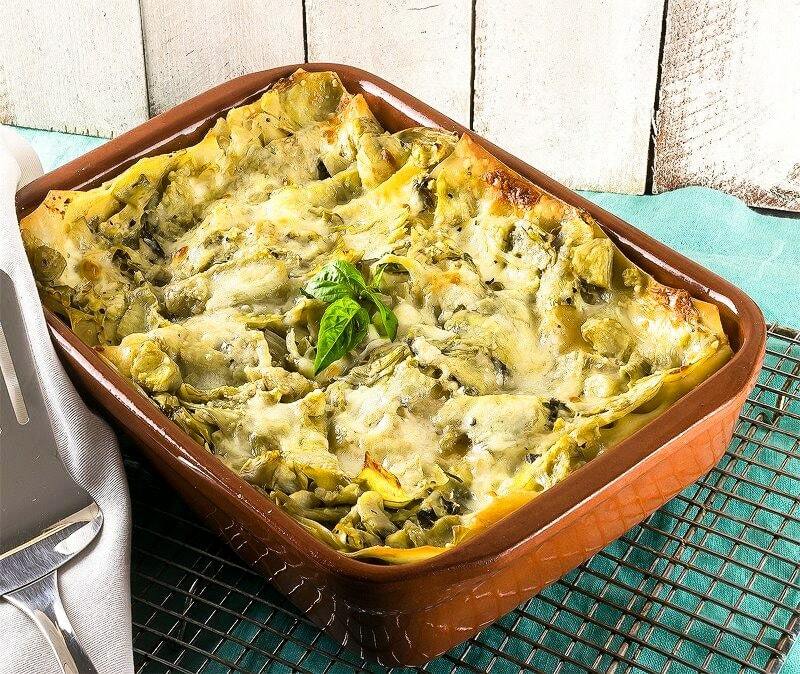 In a 9 x 12” baking pan, spread a ladle of artichoke sauce and arrange the first layer of pasta. Spread a second ladle of sauce on top of the pasta. Arrange 1/3 of the mozzarella on top of the artichokes and sprinkle with 1/4 cup of Parmigiano-Reggiano. Cover with a little broth until all the ingredients are moist. Repeat the steps twice, ending with a layer of Parmigiano-Reggiano and mozzarella and adding the rest of the broth to cover all of the ingredients. Bake uncovered at 350°F for 30 minutes or until bubbling. Remove from oven and let rest for 15 minutes covered with foil. Slice and serve while still hot.